You see you should add to the front. I give you a pic about enlarging the front 1 cm. You cut at center. You slide each panel o.5 cm to the right and left. You enlarge the front crotch diameter so that you will have 0.5 cm more. Now connect back to the knees. You have to enlarge your waist dart. 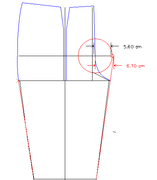 But seeing your side view I would enlarge the back dart this amount, so the seam would run more straight. This a very modest alteration - you add 2 cm more in front. For the zipper there are more than one way to do this. I attach 2 pics from my leaflet which shows how to sew in the zipper. It is not the way the master tailor do it. It is my way and it works for me. There was no how to, so took a guess. Hopefully right, feels better, more room for dress. That is a good help, however, guess I am not clear. Ich gemeint Konstruktion, nicht Material. Really late and been ages, so hopefully not too off. This is the fourth trouser ever sewn, only watched one short video, nothing more, nothing less. I also sewed in the fishform dart so hopefully get a more honest drape. The wool fabric for the trial trouser and later other parts of the suit arrived today, two days shipping! So no set in creases and immediately draped over the ironing board. Was supposed to be a medium brown, however a medium dark taupe or grey depending on the light. Been watching it in the sunlight all day and is playful. Interesting weave also. Looking forward to getting started on the trouser, though first need the help adjusting the pattern. Find the line S-S2 on your muslin. On this line mark a 0,5cm distance at S and another one at S2. Find the waistline on your muslin. On this line mark a 0,5cm distance at b1 and another one at B1. Take your paper pattern and put it on your muslin, point S and point b1 matching the new marks. Using you paper pattern as a template redraw the sideseam from S upwards to the waistline. The new line should be parallel to the old one but 0,5mm apart. Redraw the fly seam in the same manner, 0,5cm apart from the old. Now mark another 0,5cm on the muslin at the new S2. Now put the paper pattern on the muslin, matching K2 and the new mark. Redraw the inseam from K2 to S2 using the paper pattern as a template. Also redraw the outer seam from K1 to S, using the paper pattern as template. That´s it. Resew the muslin and try it on. I am so confused, why sew another muslin? Can't I simply adjust the pattern in the same way since you and posaune agree the fit is correct? On the pattern, not understanding how S and S2 move, are you saying move out each 0,5cm to lengthen the line 1cm? So also lengthen b1 to b2 by 1cm also? So take an additional 1cm each at the dart? The 2cm of fabric has to go somewhere and rather not take it up in the waistband seam. Seems this all is for the front and doesn't answer the question which I had: how to take the fishform dart out of the rear? My thought is to split the pattern and tape back together, though rather spend another couple weeks going through the process rather than to waste wool fabric. Again, know really appreciate all the help, went from lousy to amazing, to really amazing feel. Color not showing quite right, more grey. Yes, lentghten the line S-S2 0,5cm to both sides. Also at B1 and B2. with these marks you can use your paper pattern as a template. The procedure makes each top side 1cm wider. As Posaune wrote, take this additional 1cm out with a wider back dart. When we see the new muslin we can say wehter the alteration was successfull. You should change the paper pattern later. Oh! I got you, the pictures are not showing on the public side, just mine. Okay, will go fix the darts (which then will total 3cm) and try again on the pictures. Let's try this again, with everything sewn. Couple of things I noticed. One, the crease in the rear instead of angling toward the top center as all my pants seem to do, now vertical. Second, this is the second pair of trousers I have that have enough room for dress, thank y'all! So did you make the fronts wider? Seems yet too tight to me. When doing pockets, they will gape enormousely. I agree with peterle, What you are wearing in this image has no ease whatever. It looks nice and tight, which is the fashion. On the other hand, can you imagine sitting down in them? They would surely rip. Even stairs will be too difficult. A tight fit can have movement. In any case, the modern style is only possible with stretch fabric, and these drafts are not designed for that kind of fabric. It only needs a bit more ease. I have a pair with no pockets and love it. I don't use them anyway, so why have them? Now that think about it, maybe that is why women's clothes in general don't have pockets: tight fitting and pockets would gape. After I try on a garment and the pictures are done, most times wear it for a while, though last time braved it and went and got the mail. Heck, just so happens I climbed a ladder to put up laundry yesterday while wearing these, be willing to demonstrate. That is why I know about the dress fitting. When sitting, there is no pulling. However, they have less ease after the darts were taken. These pictures I posted earlier though didn't go though show the difference. I left the old dart stitches in if needed to go back, do I? what do you mean with: "they have less ease after the darts were taken"? As Posaune wrote, take this additional 1cm out with a wider back dart.